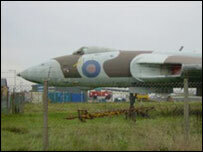 The former RAF nuclear bomber put up for auction on the internet has been sold for £15,000 to a pub landlord. A Manchester publican had the highest offer when the week long bidding closed on eBay on Saturday. He is due to hand over a cheque to the owner Brian Bateson on Sunday at Blackpool Airport, where the plane has stood for 21 years. A spokesman for the airport said the jet's new owner would be revealing his plans for the plane and its new home. Earlier this week eBay had to deal with hoax bids of more than £7m. Pilot Mr Bateson, who bought the XL391 from the RAF, had set a reserve price of £6,000.